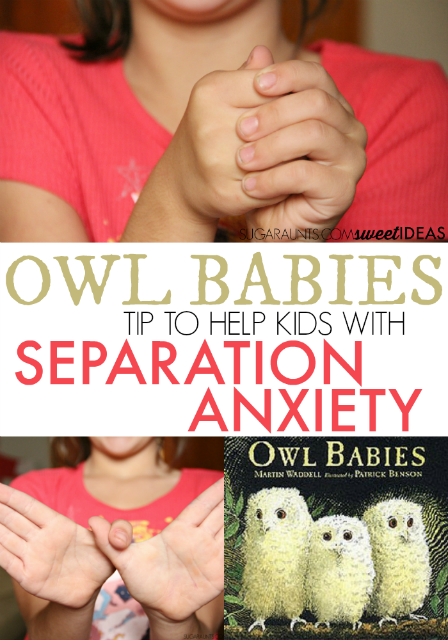 This post shares movement based activities that can help kids who are experiencing separation anxiety in preschool drop off, with ideas based on the children's book, Owl Babies. We walk into Sunday School and my Toddler turns from a smiling little girl in a fluffy church dress into crying, runny nosed little sweetie that just needs a giant hug. Two minutes later, she is happy, playing with play dough, and dry of all nose drips. We are at the point where the tears are just part of the routine. My little one is on the young side for getting over the separation anxiety, but as a momma of four, I've seen plenty of tear-filled drop-offs. And it never stops breaking my heart. Today, I'm sharing a simple trick for helping kids with separation anxiety at preschool or other drop-off situations like our weekly church nursery adventure. 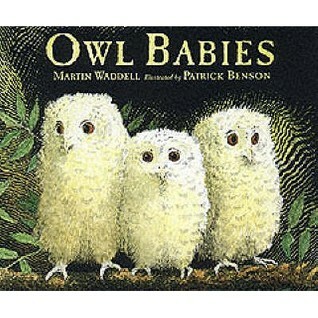 We read the book, Owl Babies as part of the Virtual Book Club for Kids series and fell in love. The sweet little Owl Babies in the book wake up from a nap to find their mother gone from the nest. The owl siblings go through a series of concerns and thoughts about where their mom might be with a little almost-tears. My older kids thought the book was pretty awesome and decided that each of the owl babies in the book were one of the girls in our family. There were a few similar personality traits that aligned with the owls in the book and the sisters in our house. The idea of knowing that mom comes back when she leaves is a lesson we're going through at Sunday School each week and one that happens so often with kids. Just like the Owl Babies, it can be hard to stay calm and not worry when mom goes away. We decided to come up with an owl themed movement activity that kids could do when they are feeling anxious after leaving mom or dad. This activity would be perfect for preschool kids who are experiencing separation anxiety at the start of school or in a new classroom situation. To do the activity, first read Owl Babies together. Then, talk about how the owls in the book must feel when they see their mother has gone out of the nest. Finally, talk about how when the mom or dad in your family has to go away for a little while, they always come back and that they are thinking of the little one in your home while they are gone. One easy way to help with separation anxiety is to come up with a hand signal. 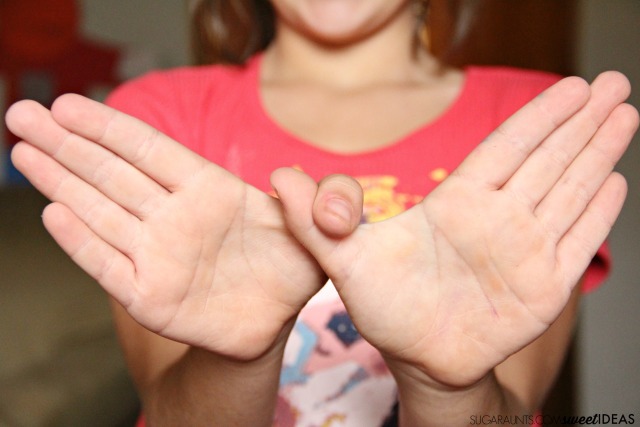 We decided that making a bird wing sign would be a lot like an owl in flight. Hook your thumbs together and spread your fingers out to create the wings of an owl. Then, wrap both hands around your thumbs to create a little owl baby of your own. Now, squeeze your hands tight to give them a hug. Your child can do this motion when the are feeling sad or nervous at school. Tell them to think about the owl babies in the book and how they felt when their mom came back. Squeezing the hands tightly can provide a bit of proprioceptive input that is calming in a stressful situation like the preschool drop-off. A simple hand hug might be just the thing that can help! Then, when you pick up your little baby, be sure to swoop them up in a big hug! This activity would work with preschoolers who are a little older than my two year old. She really enjoyed the book, Owl Babies, though and we have read it again and again! 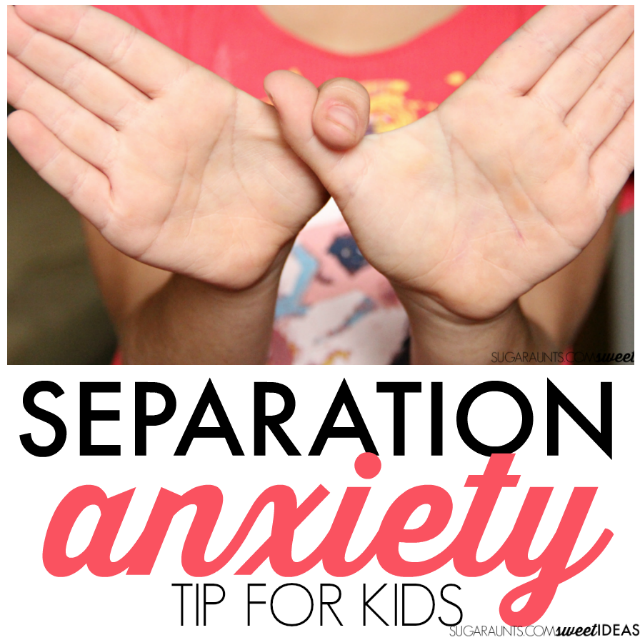 Let me know how this tip to help with separation anxiety works with your preschooler!